The story in one sentence: An agoraphobic psychologist helps the police to identify a “copycat”- killer, and finds out that she might be a target, too. Storyline: Through a tragedy in her past that almost caused her to be killed, Dr. Hellen Hudson (Sigourney Weaver) is trapped to her own home. Her way only way of communicating with others is her computer and a friend that takes care of her. When a new serial killer (William McNamara) attracts the attention of the police Hellen is asked to help. As a criminal profiler she immediately figures out that he is copying the work of other known serial killers. Little does she know that her own life is now in danger. 1. The Storyline is not shallow and it is obvious that someone worked it out into details. 2. We have convincing actors. Sigourney Weaver is gold, I felt her tension and desperation through the whole movie, and William McNamara as the evil guy is amazing. 3. We get to know the serial killer a little, and even if we can’t relate we get an unerstanding of why he is doing what he’s doing. There are many new movies that won’t even bother telling you about the intentions of a killer. 4. Suspenseful music is used at the right moments. I got chills in some scenes. Copykill is an atmosperic thriller that – even if the face of the killer is shown very early – keeps you at the edge of your seat until the very end. Pingback: Confine (2013) – Already forgot about it | Simon Says... WATCH THIS! 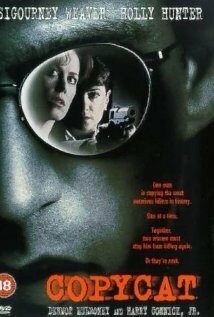 definitely I love thrillers from the 90s. Pingback: Ray Donovan – Showtime’s New Show about a “Fixer” | Simon Says... WATCH THIS!